MORGANTOWN, W.Va. – Surgeons at the WVU Rockefeller Neuroscience Institute have performed the state’s first laser interstitial thermal therapy (LiTT) procedure for drug-resistant epilepsy caused by focal seizures. Focal seizures, also called partial seizures, are those that arise from a single area of the brain. The seizure source is removed during the LiTT procedure, which is minimally invasive. This will lead to a complete cure or dramatic improvement in the patient’s epilepsy. While the patient is under general anesthesia, the surgeon drills a small hole into the skull. With MRI guidance, the surgeon threads a laser wire toward the source of the seizure, and heat is used to destroy the region. The wires are removed, and the incision is closed with a few stitches. 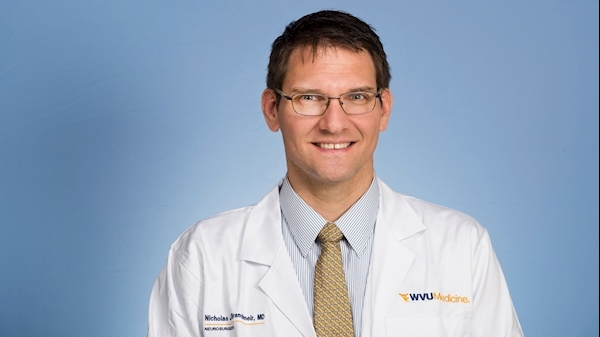 The first patient at WVU Medicine to undergo the LiTT procedure required a selective amygdalohippocampectomy, during which the hippocampus was removed. Patients who undergo the LiTT procedure generally experience less pain and a faster recovery period after surgery compared to those who undergo traditional open surgery. The WVU Medicine patient was discharged the morning after the procedure was performed after spending one night in a regular hospital bed. According to the Centers for Disease Control and Prevention, more than 3 million people in the U.S. have active epilepsy. For the majority of patients, the cause of epilepsy is unknown, but some epilepsy is caused by stroke, brain tumor, traumatic brain injury, central nervous system infection, loss of oxygen to the brain, genetic disorders, and other neurologic diseases. While medicines work for most people with epilepsy, surgery can stop seizures or make them easier to control with medication. For more information on the WVU Rockefeller Neuroscience Institute, visit wvumedicine.org/rni.